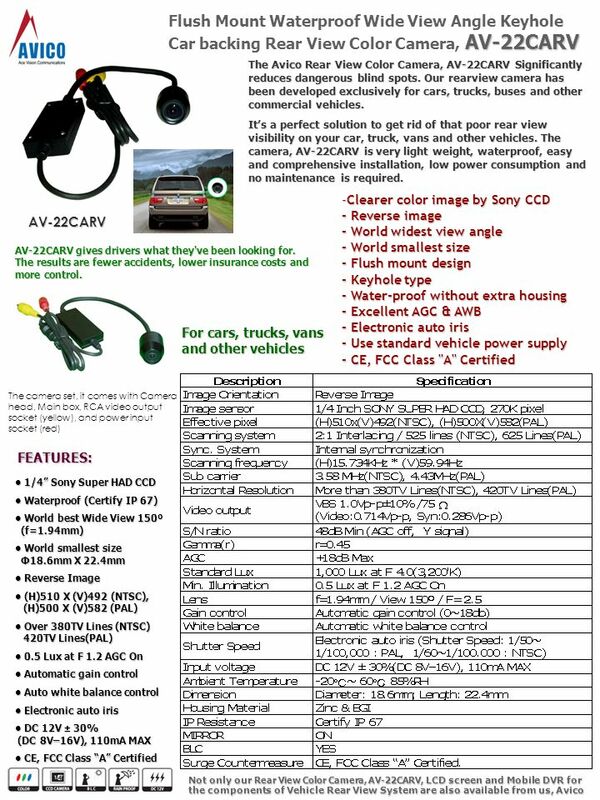 AV-22CARV Flush Mount Waterproof Wide View Angle Keyhole Car backing Rear View Color Camera, AV-22CARV The Avico Rear View Color Camera, AV-22CARV Significantly. 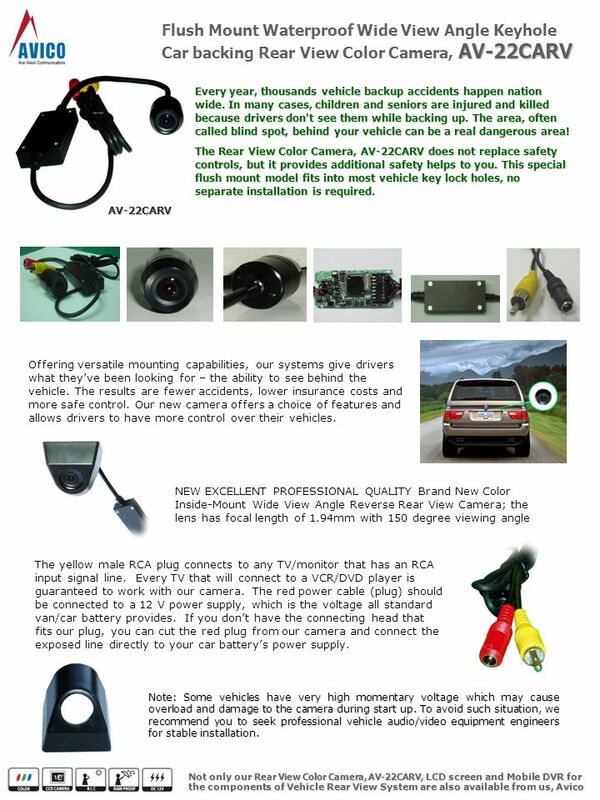 Download ppt "AV-22CARV Flush Mount Waterproof Wide View Angle Keyhole Car backing Rear View Color Camera, AV-22CARV The Avico Rear View Color Camera, AV-22CARV Significantly." Cool new cameras and mini-domes from Baxall. HT-7815DNV IR DAY/NIGHT CAMERA BUILT-IN LEDS & CDS SENSOR BUILT-IN HEATER/WEATHERPROOF ALL CONTROLS ARE EXTERNAL ALLOWING THE CAMERA TO REMAIN FACTORY. A/V Connectors & Cables. Chasis Mount Connector A connector that is built into a piece of equipment. LED Lighting Saves Energy Lasts Longer Much Safer Advanced optical designs for perfect lighting decoration. Module 1: Safety. Objectives Outline safety rules that apply to conditions at homes, labs and workshops, and jobs. Identify electrical hazards and learn. 1 UltraView IP Fixed Cameras 14/10/ IP CAMERA SUMMARY + = UVE-101 encoder UltraView analog cameras + = UltraView-IP cameras OR. Who is TRU-Vu? · Supplier of full line of high-quality, customizable, industrial and commercial LCD monitors · Specialize in custom and OEM designs, even. What is Thermal Vision? Surveillance beyond the visible PTZ ThermalThermal in ActionFind out moreFixed Thermal Surveillance beyond the visible. www A New Force in CCTV Cameras and Accessories Discover why the industry is talking about Hawk-I Security… All cameras come with a 3 year warranty All. Heavy Duty System. BE-970FM HEAVY DUTY MONITOR Single/Split/Tri/Quad Mode Scan Feature High Resolution TFT LCD Adjust up/down and Mirror/Normal per channel. Camera Systems SAFETY MEETING. Back-up Alarms Alert pedestrians to vehicles backing. Camera Systems Alert the driver to people or objects behind his vehicle. 1 HD-SDI HIGH DEFINITION Video HD-SDI uses RG-59 or RG-6 for video transmission. Will not work on CAT5/6 Distances of 500 feet are possible without repeaters. FLEX LITES SoLICo Flex Lites. 1 CCTV SYSTEMS CAMERA MOUNTS AND ENCLOSURES CAMERA MOUNTS AND ENCLOSURES. Efficient flexibility in room management with SAUTER EY-modulo. 1. Mechanical IR-cut filter built-in AVIRD-F40HQD is equipped with a Mechanical IR-cut filter, which produces accurate color image under natural light.